The area around Southwest Eighth Street and 15th Avenue is where the improvements will take place. Regalado proposed to extend the plaza because of people constantly dancing on the street late in the evening, interrupting motorists and causing traffic problems. “We’re not going to prohibit people from dancing, so we will accommodate everyone,” he said. This project is one of many that he and city commissioners have teamed up on for the augmentation of Little Havana. Other projects in progress include the restoration of the the Tower Theater, the overall refurbishment of Domino Park and bringing the trolley system along Calle Ocho. Though the mayor hopes this project starts as soon as possible, that is not always a reality. “Unfortunately the city of Miami and the bureaucracy take a long time. Some of our other projects still haven’t been finished, so unfortunately that’s one area of government I haven’t been able to overcome yet,” said City Commissioner Frank Carollo. 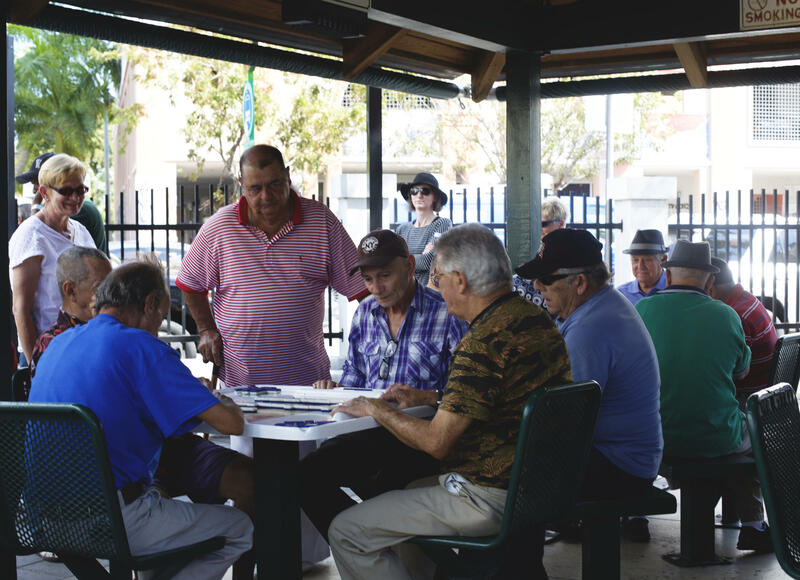 Locals play in Domino Park in Little Havana.